I don’t have any major highs or lows from the past week – just a bunch of mediums. I didn’t make anything new that was tasty. I’ve gotten to the point where I’m now recycling recipes. Made meatloaf. Again. Made tortilla soup. Again. Made apple crisp. Again. All were as good on round two, but lacked the thrill of their initial debut. The one dish I made anew was a real testament to my inability to use spices. In the crockpot I threw two chicken breasts, a can of diced tomatoes, chicken broth, diced peppers, and about two shakes of oregano. Almost as tasty as a damp towel. My husband came home late that night. I was rocking the baby to sleep and could hear him load up his plate in the kitchen, walk downstairs to eat it, then immediately walk back upstairs and shake the life out of the salt and pepper trying to revive that dish. I have not felt very inspired on the cooking front. What if I already peaked with the gyro meat? What if it’s downhill from there, back to bag meals and butter noodles? I would attempt to find a new meal to conquer this coming week, but my husband will be out of town on business for his longest stretch ever, so I’m just going to stock up on PB&J and pray I survive. In other news, I think my former coworkers discovered this blog. If I’m right, maybe one of them can comment on this post and tell me how awesome it is. On the craft front, I’ve been similarly uninspired lately. 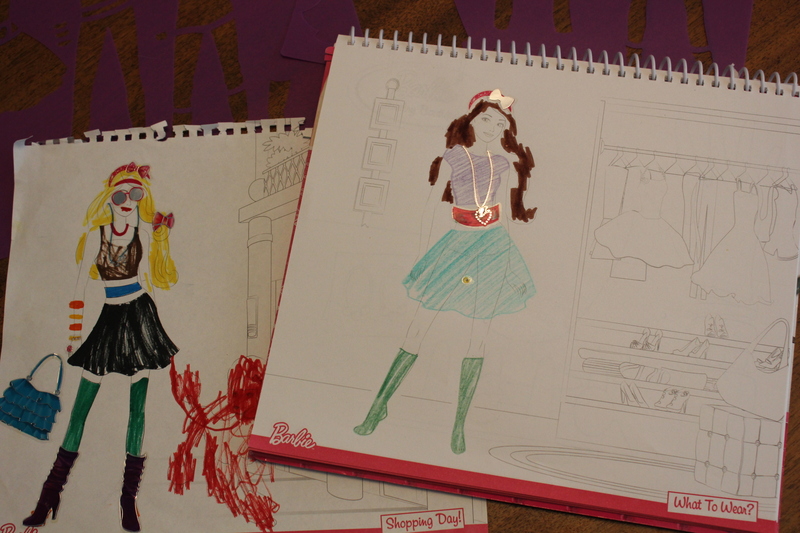 In an attempt to find something new, I pulled out a Barbie coloring book that my mom bought my daughter last year. It entertained her for a bit, but I couldn’t help feeling a bit leery about it. Barbie is like the anti-Christ for a lot of parents. I played with Barbies and think I turned out OK, but there is undeniably something hooch-ish about that girl. Why yes, my skirt is see-through. I gave her the benefit of the doubt because my daughter was having fun decorating her with stickers and clothes. But then my husband got involved. As he chose a dress to stencil on Barbie, he commented on how nicely it hugged her hips, and kept asking me what it’s called when a dress gathers around a waistline (ruching). Next he put Barbie in some thigh-high black boots to accentuate her “nice long legs.” Then he brought her into the kitchen to show me the finished product, and joked that maybe I should get an outfit like hers. That sealed the deal. I threw that homewrecker and her trampy coloring book in the garbage the next day when the kid wasn’t looking. 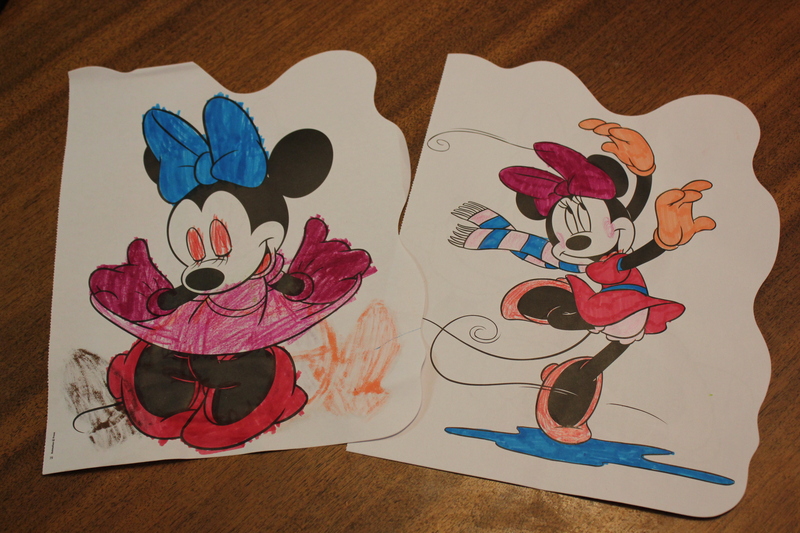 Back to the safety of Minnie Mouse and her nonthreatening, oversized mitten hands. 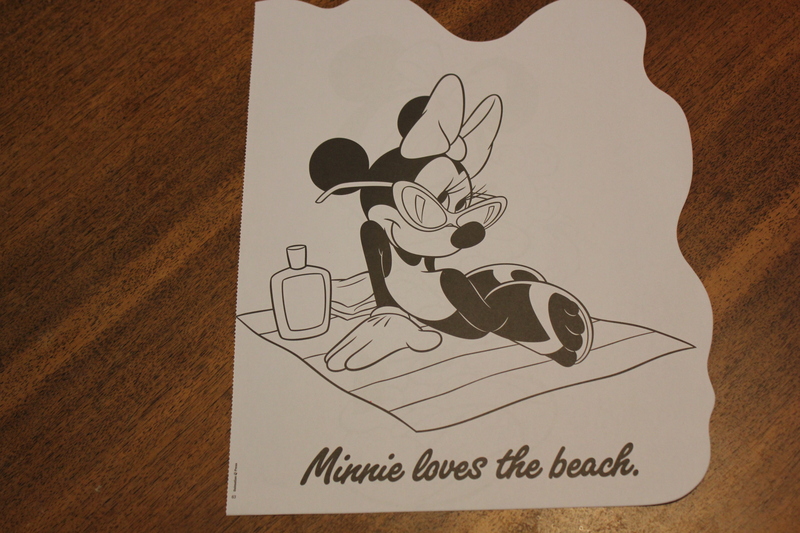 Although it looks like even Minnie can’t resist sexing it up now and then. She is totally flirting here, right? Seriously, what do you think is under those mittens? Why can’t she take them off even at the beach? Webbed fingers? And actually now that I see her giant club feet in those flip-flops, I’m even less concerned about her stealing my man. Granted, I have Paul Bunion, but homegirl has a bit of sasquatch in her.